ABSTRACT: Calcareous nannofossil assemblages were investigated across the Oceanic Anoxic Event (OAE) at the Cenomanian/ Turonian Boundary (CTB) in a section from the Western Interior Basin and a borehole from the New Jersey coastal plain. 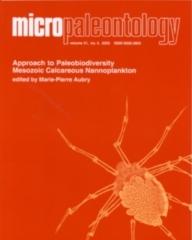 The objectivewas to determine the surface-water response to environmental perturbations during the OAE.Adecrease in surface water fertility at the two localities is suggested by an increase in relative abundances of taxa with oligotrophic affinities and a concomitant decrease in taxa with mesotrophic or eutrophic affinities. Oligotrophy and anoxia at both localities are likely responses to increased water-column stratification associated with the incursion of warmer waters from lower latitudes.